Have you ever wondered what it’s like to work where tourists go cage diving with white sharks? Here’s an inside view from above the waterline. Working in a place where others spend their holidays is nothing special. Tourist guides, waiters or scuba diving instructors share the same fate: they must toil where other people spend their best weeks of the year. But working on a cage-diving boat for white sharks, like Alex Wright did on three different continents, is something out of the ordinary! “Another shark approaches my bait line from the right. I pull the bait, and within seconds I see both sharks almost collide into one another. “I saved the bait. I throw it back in and as minutes go by, I notice another dark shadow approaching from the depths. In those few seconds, I pull the bait just as the 13-foot great white shark opens its mouth, revealing those sharp, beautifully triangular teeth and red gums. It’s breaching on the bait, showing its power, ferocity and speed to everyone. Alex Wright is 28-years old and lives in Maryland, USA. We share a passion and have a similar biography: we have loved sharks throughout our lives. “Jaws” was the movie that caught our interest. From that point on, independently of each other, we read everything we could find about sharks: Books, newspaper articles and scientific papers. We watched documentaries on TV until we were old enough to get a scuba diving license. We fell in love with their mystery, their awe, their power, and the unknown of the shark. Specifically, the great white shark left a spot on our soul. We both knew we wanted to protect sharks and our marine world from destruction. The great white shark became our obsession and passion. But from then on, we took different directions in our lives. I became a journalist in Berlin, Germany and Alex became a scuba diving instructor and research assistant on various cage-diving boats in South Africa, Australia and Mexico. Alex begins by telling us there is not much in the way of shark or global marine conservation in Maryland. “The closest thing was scuba dive shops, or an aquarium, and although I had interned at the aquarium, I had too little experience to be guaranteed a job after graduating college. I kept looking and working two jobs after graduating with a degree in animal behavior. “A friend on Facebook told me about a program that teaches basic boating skills and assists with hands-on shark research. That program was through White Shark Africa, and I interned for them in June and July of 2016. I did not so much decide to work in the cage-diving industry as fate decided it was time for me to get involved. “Cage diving in South Africa was my first time cage diving anywhere in the world, and my first time in the water with great white sharks. It was special to me because it opened my eyes and my soul to their presence and power and, more importantly, their plight. Books, documentaries and words can only do so much for the imagination but seeing them up close for the first time is unforgettable. 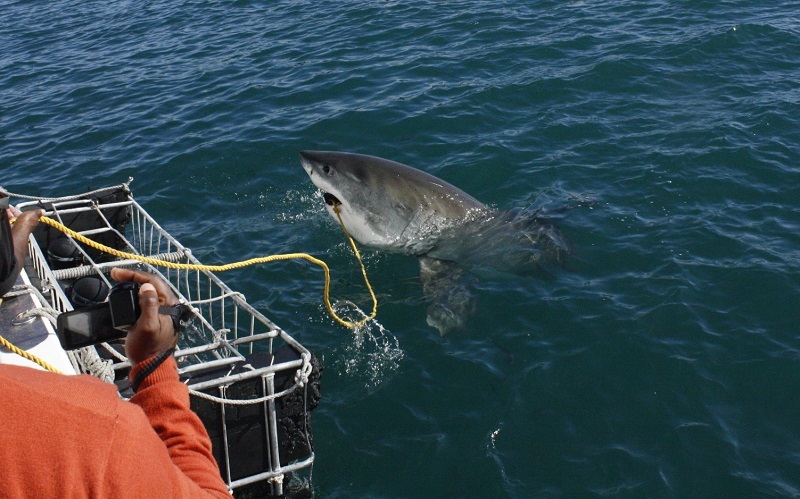 “The day I arrived in Mossell Bay, another intern and I got in the cage and I saw my first great white shark. It came in out of nowhere and looked deep into my soul. Beautiful, dark blue eyes, such an amazing experience as they followed me while the shark was circling. It was the most powerful experience I have ever had, and I was ready to share this event with others. “When visitors first arrive at White Shark Africa, you check in, and are given breakfast and order lunch for after the trip. Once all the guests have arrived, there is a briefing, normally given by the interns, on the great white shark and their plight, and what the staff wants the clients to take away from the experience. “After the briefing, the clients are led out to the boat by the crew. It is a 15-20-minute boat ride from the dock to Seal Island, and the average trip lasts three to four hours. The difference with cage diving in South Africa, as opposed to other locations, is the lack of scuba or surfaced supplied air. “In my opinion, guests who hold their breath, exhale bubbles, or use a snorkel have a much more personal interaction with the shark and, of course, the terrible visibility. There are no weight vests or weight belts, just a wetsuit, hood and booties. “Another big difference is the cages, which are smaller and more confined for five to seven people. The cages have inner bars that clients can hold onto when in the cage, and lower inner bars to ground their feet. “After arriving at Seal Island and dropping anchor, a cage or safety briefing is given to the guests. The cage is then pushed off the back of the boat with the help of a pulley and tied off to the side of the boat. “We use tuna heads for the bait and chum the water with mashed up mackerel to create an oil slick to attract the sharks. After baiting the water with a tuna head and some chum, it is time to wait for the shark(s) to show up. “With help from the crew, the first group gets ready as soon as the first shark appears. The bait handler yells which direction the shark is coming from, so the clients can pull themselves underwater and watch from that direction as the shark swims by. “Cage time was based on shark views instead of time, so if you had no views you could be in the cage for over an hour if the temperature did not get to you. “The sharks that showed up in Mossel Bay were mostly juveniles ranging from two to four meters (six to 13 feet). Mossel Bay is thought to be a feeding ground for juveniles before they move up the coast to hunt bigger prey items. However, a two-meter white shark, up close in terrible visibility, still looks like a pretty big shark to the untrained eye. “While my main responsibility as an intern was to assist with the day-to-day operations, I also collected data by surveying the bottom of Seal Island to identify the species of fish and other marine life that made an appearance. “As an intern and a photographer, I was also responsible for taking photos of sharks to help identify the individual sharks. During the weekends, the interns could travel either to Cape Town or Durban for two days of scuba diving. This concludes Part One of this story. Be sure to check back for Part Two when we will return to see what Alex is doing during his travels to Australia. Christian Kemper is a TV journalist from Germany. He has been diving with and studying sharks for more than 20 years. He has written two books about shark attacks and one book about crocodiles. He is a freelance writer for 3 of the biggest diving magazines in Germany. He has also written a three part article about how cage diving with great white sharks began.